Whoops - my pledge to post regularly slipped a little, there. Sorry 'bout that. This is Day Plus Eight, and all the news is good. During our little interstice Karen has mostly been feeling rotten and barely eating; her white blood cell count was down to 100 two days ago, which is awesome and ideal and kinda scary also, because what if it didn't turn around? Also she had to have an infusion of platelets, because that count had dropped below 10K which is getting into non-clotting territory. A bag of platelets looks remarkably like a bag of my semi-gelled chicken stock, but I was good and didn't ask to taste. Since then, though, K has been feeling better and started to eat: banana oatmeal in the mornings (for I am awesome and thought to bring steel-cut oats with me, and bananas are the only fruit - other than avocado - that she's allowed in neutropenia) and then the soups and pastas of the astronaut food. And today we had another blood count, and her numbers are way up, to 1900 little white blood cells and 45K platelets. It's the ultimate hairpin, your numbers crash downward and then swoop upward, and this is the ideal path to follow. She is still in neutropenia until she hits 4000 of the good white stuff, but the doctors are confident she'll be there by Tuesday. Then she gets a final infusion, and basically we relax until Saturday, when we go home. Meanwhile, as foreseen, her hair has fallen out. Most of it, anyway. 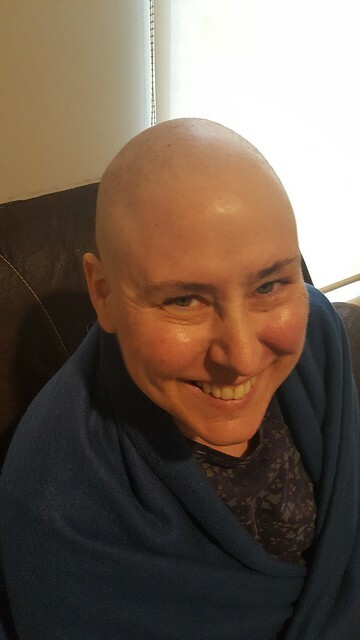 The sad remnants were shaved off yesterday, and behold: is she not beautiful?